"Air Marshal Harold 'Mick' Martin DSO, DFC**, AFC & Squadron Leader David Shannon DSO*, DFC*"
Two highly decorated Australian Dambusters. 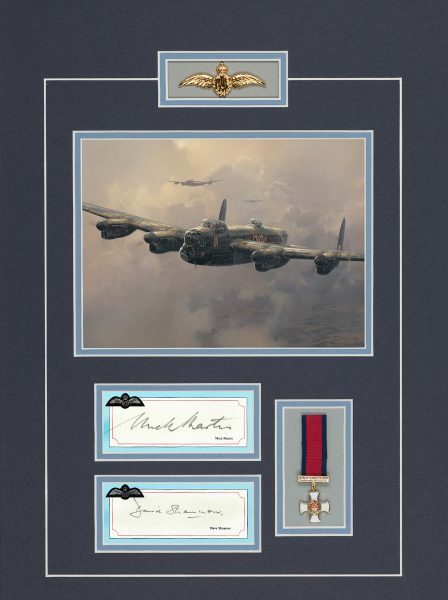 Flying Lancasters with 617 Squadron, Mick Martin was Guy Gibson’s deputy leader on the Dams raid, Martin’s aircraft being the third to run in on the Mohne Dam. David Shannon’s run was called off as the dam was breached but carried on to be the first aircraft to strike the Eder Dam. Both Lancaster pilots were awarded the DSO for their part in the raid. Leonard Cheshire was quoted as saying “Mick Martin was the bravest pilot I ever met”. Mick Martin in turn credited his loyal crew as the most courageous men he ever knew. Such is the way with real heroes! There can be no doubt that both Mick Martin and Dave Shannon were among the many who displayed uncommon courage consistently beyond the call of duty, and their 10 medals for gallantry support their actions. To represent one of the RAF gallantry decorations each one of these pilots received during World War Two, a miniature replica Distinguished Flying Cross medal has been expertly mounted into the display.